Outdoor Living in Christchurch, a property with barbecue facilities, a garden and a shared lounge, is set in Christchurch, 4.1 km from Victoria Street, 5 km from Christchurch Art Gallery, as well as 5 km from Canterbury Museum. This holiday home also features free WiFi. This holiday home with garden views has parquet floors, 4 bedrooms and 1 bathroom with a bath, shower and free toiletries. A flat-screen TV is featured. If you would like to discover the area, cycling is possible in the surroundings. Re:START is 5 km from the holiday home, while Christchurch Arts Centre is 5 km away. Christchurch International Airport is 13 km from the property. 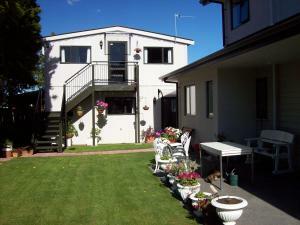 When would you like to stay at Outdoor Living in Christchurch ? This holiday home has a washing machine, oven and toaster. Please inform Outdoor Living in Christchurch in advance of your expected arrival time. You can use the Special Requests box when booking, or contact the property directly with the contact details provided in your confirmation. This property will not accommodate hen, stag or similar parties. Each day we'll check prices and send you an email for your selected dates at Outdoor Living in Christchurch. If you don't have specific dates but would like to check prices for say next weekend or say next month we can check the price too. Click to write a review and share your experience of Outdoor Living in Christchurch with other travellers.